Ever since the release of my first game, BreakOut Extreme [Play it here, if you haven’t & if you dare], which has gathered some fairly mixed reviews, there has been a long gap for my next release. I’ve to leave Games Factory 2 since the Free version has expired, which made me migrate to yet another free & opensource game Making software called ‘GameEditor’. Although it was frustrating to become familiar with GameEditor, the in-software tutorials were helpful & the flexibility it offers by the integration of C-style Script-Editor was so Cool. So Technically, this is my first GameEditor game to be published. 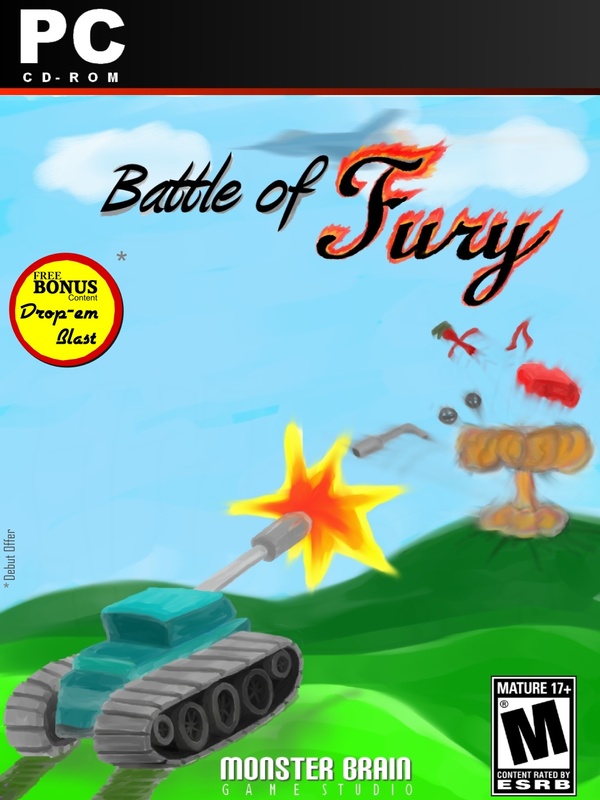 The idea was to create a Two Player versus Tank fighting game (a.k.a Pocket Tanks, inspired by), but later went into some technical issues regarding second player. Hence the game is modified for Single-Player. Its also the first time i’ve implemented a ‘Menu’ system for a game. Since this is my first release of a Downloadable Title, i’ve decided to put up a Box-Art using Twisted Brush Studio. (Of course the Game may not look the same as given in the Box Art, which is true for all games). Since the Alpha version of Battle of Fury, I’ve been testing on a Shooting methods using Mouse, angles, tan() etc. What started of as a testing, later grown into yet another game. So i decided to add that too with the release. As a Bonus for all my beloved Game-Players. Games are pretty Rough & Tough. Hope you’ll enjoy it & feel free to Criticize & Praise it. BOF is a One-Button Game [Most probably Space-Bar] & Drop-em-Down is a No-Button Game. Here is one Basic Brief Tip for you if you want to win. Thanks to Almighty, my Family, my Facebook friends, Newsgrounds, GamesFactory & Others. Next story Re-Watchable Movies : Are you going to watch it Again ?